This sale in Lakewood, NJ is a “By Appointment” sale. Please see sale info below for details. The items in this home are all like new! PLEASE ! Read details following content! Beautifully coordinated living room sofa, armchairs, end tables, coffee tables, lighted crystal cabinets, framed wall art, beautiful dining room set , oval table, 6 chairs, china cabinet, hutch, servers, cocktail server, wall decor, pier cabinets, case wall clock, round kitchen table with glass top, 4 kitchen / dinette chairs, brown leather sofa with 2 matching easy chairs , Lenox dinner ware – full service for 10 with extra pieces and serving pieces, leather bench, decorative hall server, coffee table and end tables, beautiful entertainment cabinet, audio equipment, 42” flat screen tv, stunning master bedroom furniture with Queen size 4 poster bed with headboard, foot board nd side boards, 6 drawer tall chest (64”) night stands, triple dresser with mirror (78”) , French provincial bedroom set in gorgeous condition, decorative accessories, household goods, pot and pans, kitchen items, cleaning supplies, kenmore refrigerator- like new – upright freezer, catering and party supplies, small appliances, MANY Christmas decorations and supplies, like new, both indoor and out door, craftsmen tools, craftsman tool cabinets, tools, tools, tools, outdoor equipment, rakes, fans, electric skee ball game, indoor shuffleboard tournament game with score board, beautiful pool table, tchotchkes, silverware, glassware, dishes, handbags, shoes, CLOTHING (women’s larger sizes) 90% of clothing is new with tags, new shoes, men’s clothing, coats!! ***This sale is in a gated community that does not allow traditional estate sales. We will be providing appointment times beginning Jan 20th. 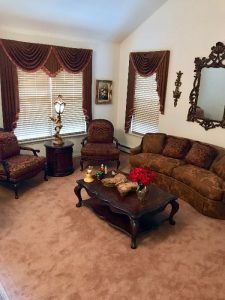 Meanwhile, we WILL CONSIDER pre-sale of some larger items like living room, dining room, family room, bedroom furniture, complete Lenox collection, clothing as a lot ( ready to sell for resellers !) Please send an email with the details of your presale interest to: info@medfordcompanystore.com and provide a phone number. FOR APPOINTMENTS: Please send an email to info@medfordcompanystore.com and let us know whether you want to come on Friday the 25th or Saturday the 26th and whether you want a morning or afternoon appointment. Please provide a number where you can be reached by text. We will begin scheduling appointments on January 20th. Merchandise is offered “as is, where it is”. Please be prepared to remove and transport your purchases by the end of the sale. We do NOT provide delivery services. *We accept cash and credit cards. No checks, ever. We are not responsible for accidents. Please don’t block driveways or mailboxes in the neighborhood.